I want to write about something that I sometimes struggle with, which is getting fairly compensated for the work I do. I understand this is a sensitive subject, but I feel like it is something we as yoga teachers, and especially female yoga teachers can get better at. Maybe some of you now think, "wait, that's not very yogic to be writing about money", but let me tell you something, yoga teachers still have their bills to pay for. 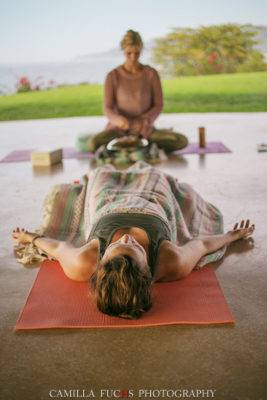 In yoga, there is something called seva, which translates into selfless service and it basically means that you do an act of kindness or you be of service without expecting anything in return. This is a beautiful philosophy and definitely something that you can incorporate into your every day life or even your yoga practice by offering free yoga classes once in a while. However, when it comes to teaching yoga as your profession, it is still work, and obviously you need to be compensated for it. To become a yoga teacher is not a walk in the park and most likely you need years of experience under your belt, at least one (usually very expensive) teacher training and lots of teaching hours. Not to mention, you need to understand human anatomy and be able to offer modifications for injuries, be creative (with sequencing and maybe playlists) and hold space. The good news is get to share what you love. A friend (who also happens to be an amazing energy worker) recently told me that she feels drained after treating her clients if the compensation does not match the energy she is putting out as a healer. This might sound a little wack to some of you, but on many levels it makes sense. There needs to be a fair exchange of energy, and yes, money is a form of energy. It is in our human nature to want to bargain and get the best deals so that we feel that we've gained something, but keep in mind, when you bargain that little extra something you're basically pulling money out of someone else's pocket. That being said, I do believe in giving local discounts, friend discounts and package discounts. Heck yes, who doesn't want a package deal! Something I've also noticed I am guilty of is the tendency to undercut myself when I want to ensure a job. I think like with basically everything else in life, clear communication also works wonders here. So my tip to you is: ask for what you think is fair and also put yourself in the customer's shoes. Does it feel good? Does it feel fair? If the answer is no, re-evaluate. Negotiating is a fine dance and a skill some people have naturally, when some of us just have to learn and get over the "shame monster" which so often is involved when it comes to chatting monetary compensation. There's a great Finnish saying that goes: "the one asking is not dumb, it's the one paying". Take it with a grain of salt please :D.
These are my thoughts, I'd love to here yours if you have any input or ideas on how to ask for what in your mind feels fair?